Quick overview Explains Einstein's theory of general relativity, quantum mechanics, black holes, the complex architecture of the universe, elementary particles, gravity, and the nature of the mind. Independent, Economist, Telegraph, Guardian, New Scientist, Evening Standard Books of the Year 2015, The Sunday Times Bestseller. Everything you need to know about modern physics, the universe and our place in the world in seven enlightening lessons 'Here, on the edge of what we know, in contact with the ocean of the unknown, shines the mystery and the beauty of the world. And it's breathtaking' These seven short lessons guide us, with simplicity and clarity, through the scientific revolution that shook physics in the twentieth century and still continues to shake us today. 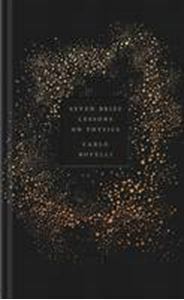 In this beautiful and mind-bending introduction to modern physics, Carlo Rovelli explains Einstein's theory of general relativity, quantum mechanics, black holes, the complex architecture of the universe, elementary particles, gravity, and the nature of the mind. In under eighty pages, readers will understand the most transformative scientific discoveries of the twentieth century and what they mean for us. Not since Richard Feynman's celebrated best-seller Six Easy Pieces has physics been so vividly, intelligently and entertainingly revealed.